You won't certainly pass unobserved among your friends and relatives wearing such a jewel 4949 combined on a brown or a beige dress enhancing your style and your love for the pure essence of beauty. OUTSIDE COMPOSITION : genuine python leather in the back section of the bag, at the sides, at the bottom and in the area around the zip closure + genuine alligator skin in the frontal section of the bag and in the external sections of double handles. 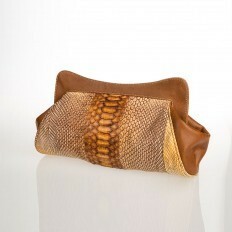 two internal pockets for cell-phones or for the lipstick, lined with python skin. Have you ever thought to combine together the elegance of python leather and the prestige and luxury of genuine alligator skin? Do you think that having such a similar handbag in your wardrobe is just a fantasy, an impossible dream? We are really glad to contradict you proposing you an original model of handbag that will leave you astonished for its refined beauty and, above all, for the intriguing combination of python and alligator, a pleasure both for eyes and for the heart. 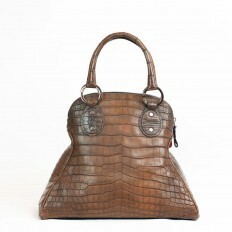 Yes, you have well understood: the bag that you are looking at, has been appositely created by our Italian craftsmen using genuine alligator skin for a frontal section of the item and for the external sections of the double handles, while the lateral sides and the back section of the handbag are made of genuine python leather in mat walnut tonality. 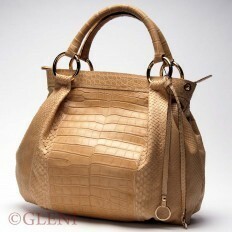 Even the area around the hidden zip closure and the bottom are lined with python skin. The final effect produced by this masterpiece of fine Italian Craftsmanship is really gorgeous and surprising. You won't certainly pass unobserved among your friends and relatives wearing such a jewel combined on a brown or a beige dress enhancing your style and your love for the pure essence of beauty. 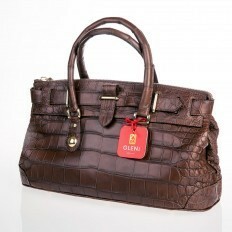 The classicality of brown tonality applied both on alligator and on python is enlightened by really gorgeous golden accessories, such as the small squared buckles attaching the small handles to the rest of the bag or the hidden zip closure or the refined twist-lock button. 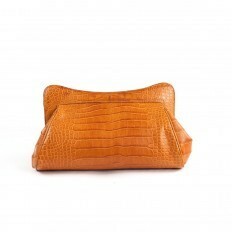 The practical internal compartment, lined with genuine calf leather in camel tonality, is provided with a lateral zippered document pocket and with two further opened pockets (lined with genuine python leather) for the cell-phone or for the lipstick. What else can we add to let you fall in love with this special jewel? We think that any word can substitute the gorgeous sensation of harmony and wellness assured by this handbag at the moment you have it in your hands. It will be love at first sight! This bag costs around 3,433.00 $.